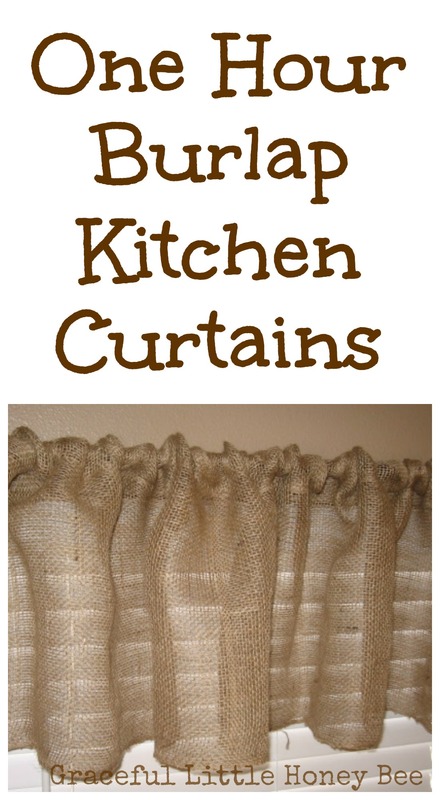 This burlap kitchen curtain tutorial is for a double window. I used a burlap table runner (that I had from Walker’s birthday party) that was about 18″ X 15′ from Hobby Lobby in the wedding section. I was going to use the Stitch Witchery no sew tape, until a lady at the store convinced me I could sew with burlap without any problems and she was right! Anyway, here is how to make the curtains. 1. Cut the burlap in half and pin your raw edge up about 1 inch. 2. Sew along the raw edge. 3. Fold your sewn edge up about one inch and pin. 4. Sew along the inner folded edge. 5. Now, fold your top edge down about 2 inches (or however much you need to fit your curtain rod) and pin. 6. Sew along the inner folded edge and your done! 7. Repeat process with second piece. That is darling! We have a big sliding glass door in our rental home and I've been trying to find something to make it look more classy and feel like hom and I think this would be perfect with some extra length and maybe a white curtain too! Hi There. Found you from Frugal Friday Link Up Party. Most of my home is rustic and primitive decor, these are going to look adorable on my windows! :) Can't wait to make them. Thanks for sharing. Thank you for this post. It's April and I still have a snowman valance up in my kitchen. EEEKKK! I found 2/3 of a yard of coffee print burlap and needed an easy way to make a valance. This is it. Tomorrow I will make it. Thanks again. Nice job! You made this very easy! I just made two sets of burlap curtains and valances for my kitchen windows even faster! 25 minutes....No sewing!! I used permanent fabric adhesive in Hobby Lobby. Beacon's Fabric Tac. I was amazed! There is a secret to cettin a straight cut on burlap....with no fraying. 1. Measure the length needed 2. Pull up the thread at that line in the middle of the fabric...grab it and pull it out!!!! 3. Cut along the line created by removing the thread! The result is a perfectly cutline that will not fray!! Enjoy your no-sew project!